Contact Dr. Mary Gautier, Senior Research Associate, to discuss ways these services can be tailored to assist bishops and other diocesan planners. This is a new report series created by the Center for Applied Research in the Apostolate. This 12-page diocesan demographic summary illustrates and explains socio-economic characteristics of both the Catholic and total population living in a diocese. Maps, graphs, and tables clearly illustrate data at the national, provincial, diocesan, and county levels. The report presents data on the size and distribution of the Catholic population in the diocese and in the entire ecclesiastical province. Census data on population race and ethnic composition, household income, poverty rates, age, and residence provide insight into the community as a whole in which the Catholic Church ministers. This report is intended for a wide audience and is easily reproduced for distribution to diocesan planners, clergy, and lay Catholics alike. 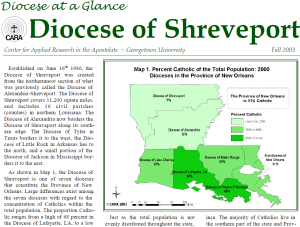 In addition to a printed report, dioceses are provided with an electronic .pdf file that may be uploaded to a website, as well as picture files of all maps. This program has been used in more than 75 dioceses over the past 20 years. Known for its precise methodology that has proven accuracy over time, these priest projections are an invaluable tool for clergy planning. The projection uses data from a single questionnaire that is provided by CARA, collecting information on the current age of diocesan priests, priest retirement age, recent ordinations, and seminarians currently in formation. The result is a report with an executive summary, followed by tables and charts with low, medium, and high projections of the number of priests who will be available to serve in a diocese through 2040. The three factors most likely to affect the number of diocesan priests available for active ministry are the number ordained/incardinated each year, the retirement age, and whether some priests continue to serve after retirement. The Priest Projection report presents 18 likely projections created by different combinations of these three factors. This allows the diocese full flexibility in using the projections as these details evolve over time. Using CARA’s extensive database of tested questions, surveys can be administered in-pew to some or all of the parishes within the diocesan boundaries. The data collected from these surveys, designed to capture information about parish life, can then be aggregated by deanery, region, or diocesan-wide. These surveys closely follow CARA’s Parish Surveys that CARA has been using nationwide for more than 20 years. Click here for more information on CARA Parish Surveys. CARA’s surveys of presbyterates assist dioceses with pastoral planning and understanding the needs of their priests. These surveys are typically conducted with all diocesan priests, including those who are retired, and with religious priests active in parish ministry. CARA adapts the questions to meet the needs of the diocese. Most dioceses that have used this service in the past have been particularly interested in understanding presbyteral attitudes about how to address parish ministry in a time of fewer priests. Many are also interested in priests’ morale, satisfaction with ministry, concerns about retirement issues, and interest in continuing formation. Contact Dr. Mary Gautier about CARA’s presbyteral surveys. Dioceses considering a presbyteral survey may also be interested in conducting it through part of a larger program, “Cultivating Unity.” CARA collaborates with the National Organization for Continuing Education of Roman Catholic Clergy (NOCERCC) on this initiative for dioceses and religious institutes of men entitled “Cultivating Unity: The Presbyterate and the Bishop.” The purpose of the program is to strengthen solidarity among priests and between priests and their bishop. The centerpiece of Cultivating Unity is a convocation where presbyteral unity is addressed through presentations, group discussion, prayer, and reflection. CARA is responsible for the research component of Cultivating Unity. Participating dioceses have the option of written questionnaires and listening sessions in advance of the convocation. This provides an initial understanding of priests’ views of unity in their local presbyterate, which serve as the foundation for the convocation. Click here to download the program brochure. A non-profit organization, incorporated in Florida June 2007 and issuing its final publications in 2014, Laity in Support of Retired Priests was a group of Catholic laity, priests, and bishops concerned about retirement issues for diocesan priests. Headquartered in Naples, Florida, their board of directors came from throughout the United States and worked to improve the quality of life for senior priests and bishops in all 50 states. LSRP was committed to developing communications to and between diocesan clergy and bishops and addressing state, regional and national issues impacting retired diocesan clergy. They worked to develop a forum for retired (senior) priests and bishops to discuss individual concerns. LSRP developed national level resources for bishops and diocesan presbyterates to use as a guide for developing diocesan retirement policies, practices, and procedures. CARA has assumed the stewardship of these LSRP resources and provides here the .pdf files of publications commissioned by LSRP, including a Best Practices document regarding pension and other retirement programs for diocesan priests, two CARA reports on diocesan practices concerning the provision of Long-term Care insurance, a CARA Special Report of a study of active and retired diocesan priests, several PowerPoint presentations on issues in diocesan priest retirement, a sample program manual for establishing a special collection in parishes for diocesan priest retirement, and other LSRP publications. Click here for the entire catalogue.